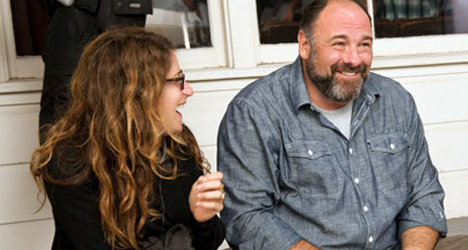 Director Nicole Holofcener shares a moment with the late James Gandolfini on the set of the romantic dramedy "Enough Said." All it took was a meeting with actors Julia Louis-Dreyfus and the late James Gandolfini for filmmaker Nicole Holofcener (“Please Give,” “Friends with Money”) to know she had found the lead roles in her new romantic dramedy “Enough Said.” Although Louis-Dreyfus and Gandolfini had never played characters like the ones Holofcener had written (not to mention mainstream audiences usually think of Louis-Dreyfus as Elaine in “Seinfeld” and Gandolfini as Tony Soprano in “The Sopranos”), she had unwavering confidence in their talent. 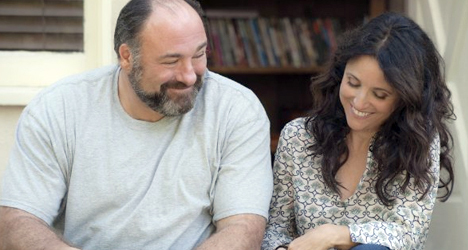 In “Enough Said,” Louis-Dreyfus and Gandolfini play Eva and Albert, two middle-aged single parents who meet at a party and start to date. Both enjoy each other’s company and their conversations are never dull. The two also connect by the fact that both have a teenage daughter who is about to leave home for college, a rite of passage Eva and Albert are dreading. When Eva unintentionally makes friends with Albert’s ex-wife (Catherine Keener), she takes full advantage of the situation by asking questions about her failed marriage in an attempt to get a sneak peek at what might be down the road in her new relationship. As a director, it must be refreshing to say you were able to cast someone in a role they have never done before. I mean, Tony Soprano probably wouldn’t be at the top of most filmmakers’ lists when casting a romantic comedy. I know! People are so dumb! I’m lucky enough to have realized that [Julia and James] could do that. Meeting them helped. If [James] didn’t have those sparkling eyes and wonderful sense of humor, I might’ve hesitated more. But when I met him he seemed like Albert, so it didn’t seem like a leap; the same with Julia. When her name came up I thought, “Well, I’m not sure. I’ve never seen her do something like this.” But as soon as I met her, I was sold. She was emotional and hilarious and nothing like the characters she’s played. She was just Julia and that’s what I wanted. Because actress Catherine Keener has been in all five of your feature films since 1996, is it important for you to cast her in a role that doesn’t feel like something she’s already done for you? How do you think you’ve been able to do that over the last 17 years? (Laughs) I think that bit of casting for Catherine [in “Enough Said”] was more intentional. I didn’t want her to play the “Eva” part. She had played similar parts like that in my movies – the “me” character or the character that is based on me. I thought it would be fun for her to play this glamorous, narcissistic poet – the opposite of me, basically. She was game. She was happy to do it. 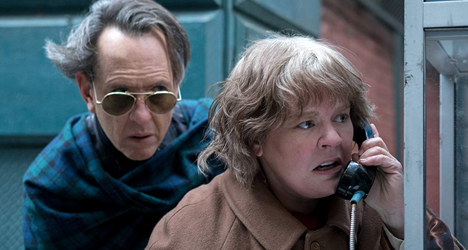 Is it a given during the casting process that Catherine is going to get a part in whatever film you’re working on? 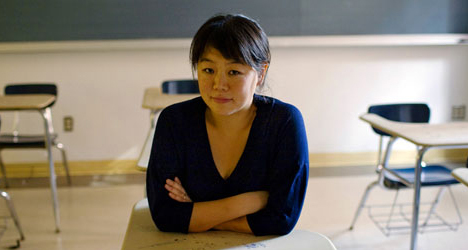 Do you know her well enough as an actress that she can bypass the audition? (Laughs) Oh, yeah, she certainly does not have to audition. But it’s not a given. It’s kind of movie by movie. She knows that. I figured, she works with other directors, I should be allowed to work with other actors. (Laughs) We laughed about that. She feels happy if I offer her a part and I’m sure she’d be OK if I didn’t. It’s just turned out that each time I have. I read the inspiration for this film came from you thinking about the foibles that drove your ex-husband crazy and the ones that drive your current boyfriend crazy. If they’re not too personal, can you share some of the things you do that are just so annoying? (Laughs) Oh, god! They’re not too personal. The ones I cover in the movie are kind of superficial. I did used to leave snotty tissues all over the house. That drove my ex-husband crazy and understandably so. That was actually a line in the movie. [Eva and Albert] are having their first date and he’s taking about the guacamole and Eva goes into how her ex-husband used to hate her snotty tissues all over the house. But the scene was just too long so we cut it. It’s not something that bothers my boyfriend, although I think I’ve gotten a lot better at curtailing it and becoming more conscious of it. Oh, my ex-husband used to hate it when I watched trashy TV. We started dating right when the E! Channel first came on the air. I just couldn’t tear myself away. But I don’t do that anymore. After I saw the film, I asked my wife if she would’ve liked to have known about all my bad habits when we first met 10 years ago and she said no. Is she lying? Wouldn’t most people want to know what they’re getting themselves into, even if you learn about little things that probably wouldn’t make or break the relationship? (Laughs) I think that even if we were to know, being in love makes you so blind and stupid that they wouldn’t bother you in the beginning. If my boyfriend had told me, “Hey, I belch throughout dinner,” which is not true. I’m just making it up. I would’ve said, “Oh, that’s so cute!” But give someone two years of it and it’s not so cute anymore. What do you think the ultimate goal is for someone who is middle aged and starting over in a new relationship like Eva and Albert? Do you think they still want to be swept of their feet or do they just want to be loved and comfortable? I think once you’ve been married and divorced, you just want someone who is not insane. I think that’s the first goal. Hopefully, the person isn’t a creep. Then you want them to have a job. Then you want them to be in touch with their feelings. Then you want them to have been in therapy. Then you want them to be able to listen to you. It’s a combination of very rational wants. I think it’s different than the first time you fall in love. Being swept off your feet is good. Certainly you want physical chemistry. That never changes. But I think it’s different when you’re older. You’re desires and what you want in a partner change. You care less if they’re handsome or rich or fascinating. As long as you find them interesting, right? It must be bittersweet talking about this film since James isn’t here to share in the celebration. When I saw the film, I just couldn’t kick the underlying feeling of sadness I had knowing we would never see him in a role like this again. He’s just so wonderful as Albert. Yeah, I think less about his performances and am just sad as a human being that he’s not here and he died too young. I am, obviously, incredibly lucky I got to work with him. He blessed my movie with his performance. But I guess I think more about him having a little girl. Ultimately, who cares if he ever did another movie? He was just entitled to live longer. You have twin sons who are 16 years old. How do you expect to react when they go off to college? Are you going to fall apart? Do you hope they stay close to home? (Laughs) I don’t know how I’m going to feel. Obviously I’m afraid of it. Ideally, they will go off to college, but not that far away and we stay really close and I won’t have a nervous breakdown. That would be a good end result. I have this wonderful career, but my kids are still the focus of my life. It’s a very weird and unfair thing that they are supposed to grow up and leave you. Is your filmmaking career going to be enough to keep you busy after they leave or do you think you’re going to have to pick up a couple of hobbies like Eva and Albert talk about? (Laughs) I think I’m going to need some hobbies! I’m going to get more pets. Maybe I’ll get to shoot a movie in Europe or somewhere like that since I won’t be tied down. I’m going to continue knitting. Maybe I’ll learn how to do some more stitches. That’s probably about it.